For users who do not have the expertise or necessity for command line analysis, PDFgui is a convenient and easy to use graphical front end for the PDFfit2 refinement program. It is capable of full-profile fitting of the atomic pair distribution function (PDF) derived from x-ray or neutron diffraction data and comes with built in graphical and structure visualization capabilities. PDFgui is also included in xPDFsuite, a powerful end-to-end software for X-ray PDF analysis. 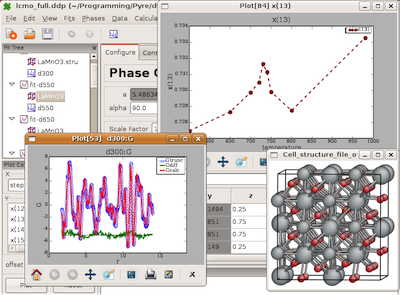 xPDFsuite is designed for flexible, high throughput PDF analyses and contains many features for interrogating, comparing and modeling data as well as simply doing data reduction. By downloading and using this software you are agreeing to the conditions specified in the software license. PDFgui is distributed as a software package for Anaconda Python. PDFgui is available for all operating systems supported by Anaconda, namely for 32 and 64-bit Linux, Mac OS X, and 32 and 64-bit Windows. As a prerequisite for PDFgui installation, download and install Anaconda for Python 2.7 from https://www.anaconda.com/download. If you already use Anaconda for Python 3.5, create a separate Anaconda environment py27 which will provide Python 2.7 instead of 3.5. On Windows use just activate py27. Make sure that py27 environment is activated in your shell prior to running the “install” or “update” commands below. All done. To start PDFgui enter pdfgui command in a Terminal or use the DiffPy start menu on Windows. PDFgui can be also started from the Launcher application included with Anaconda. To use a bleeding edge development version, visit the project source repository at https://github.com/diffpy/diffpy.pdfgui and consult its README file. Finally, here are the previous single-file installers. Although quite outdated, they might be handy if there is some problem with Anaconda or if one needs to install without Internet connection. MD5 check sums for these installer files are available here. The user manual is available in HTML and PDF formats. Tutorial files are available from pdfgui-tutorial.zip. Please, join the community forum for tips, tricks, and feedback.